Scientists at Imperial College London and the University of Melbourne have developed artificial intelligence (AI) software that they claim can more accurately predict ovarian cancer prognosis than current methods, and which can also indicate which treatments are most likely to be effective for individual patients. The software, which has been trialed through a study at Hammersmith Hospital in the U.K., could pave the way to more effective, personalized treatment, suggested Eric Aboagye, PhD, professor of cancer pharmacology and molecular imaging at Imperial College London, and who is corresponding author on the team’s published paper in Nature Communications. “Our technology is able to give clinicians more detailed and accurate information on how patients are likely to respond to different treatments, which could enable them to make better and more targeted treatment decisions.” Hammersmith Hospital is part of the Imperial College Healthcare NHS Trust. Epithelial ovarian cancer (EOC) is the sixth most common cancer in women in the U.K., and has the highest mortality rate of all gynecological cancers, the authors stated. The five-year survival rate for EOC is about 35–40%, and the cancer accounts for 4% of all cancer deaths in women. Diagnosis is commonly not made until symptoms become evident at a later, rather than early stage. High-grade serous ovarian cancer (HGSOC) is the most prevalent and most deadly subtype of the disease, affecting about 70% of EOC patients. Genomic profiling studies have uncovered a number of putative prognostic biomarkers of chemotherapy resistant and refractory HGSOC, while microRNA data has also been used to help stratify EOC risk. However, “it remains challenging,” the authors wrote, “to translate these molecularly determined characteristics into clinically relevant biomarkers due to intra-tumor heterogeneity, additional high assay cost, and time delays.” What’s needed is a real-time, noninvasive and cost-effective prognostic marker approach to help identify the best treatment for individual EOC patients. 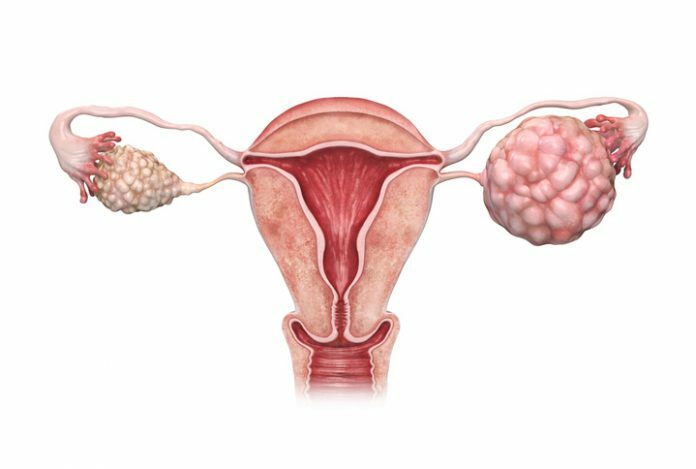 Ovarian cancer diagnosis may typically involve a blood assay to test for the biomarker CA125, and CT scans to provide a detailed view of any tumors. The tumor imaging can help to identify how far the disease has progressed and spread, and so indicate whether surgery may be a treatment option in addition to chemotherapy. But what scans can’t do is predict overall outcomes or how effective the different therapeutic options will be in reality. The researchers’ new computational tool, called TEXLab, uses machine learning to evaluate ovarian tumors based on a detailed analysis of four biological characteristics—structure, shape, size, genetic makeup—which impact on overall survival. The results are generated as a Radiomic Prognostic Vector (RPV) score, which indicates the severity of the disease and likely prognosis. In the reported trial the software was tested to 657 different quantitative mathematical descriptors, on preoperative CT scans from 364 EOC patients. Protein expression and genomic profiles of a subset of patients were also evaluated, and fresh frozen tissue samples from primary EOC patients were analyzed so that histological, protein, and gene expression data were all available to provide context alongside the RPV results. The study results indicated that the RPV score was up to four times more accurate at predicting ovarian cancer death than current blood test and other prognostic scores. The data also suggested that 5% of patients with high RPV scores had a survival rate of less than 2 years, while a high RPV result was similarly linked with tumor resistance to chemotherapy and poor surgical outcomes. Interestingly, assessing the RPV data in the context of proteomic, transcriptomic, and genetic analyses of the tumors indicated that high RPV scores were associated with particular stromal phenotypes and activation of DNA damage response pathways, which could feasibly hint at therapeutic targets. “Overall, stromal phenotype on one hand, and proliferation and DNA damage response pathways on the other, were respectively activated in RPV-high and RPV-low tumors, all of which are potential actionable therapeutic targets in HGSOC,” the team commented. A larger study is now being planned to find out just how accurately the software can predict surgical outcomes, and how individual patients will respond to particular treatments. Importantly, the RPV prognostic model is simple, and only requires information from a patient’s routine CT scan, which is available immediately without extra costs. The software is also fast, and can compute the RPV of 80 EOC datasets within 5 minutes on a standard computer, the researchers pointed out.